I would have bet against the Tube CAD Journal ever going this long, as few efforts ever do. How many of you have already broken your New Year's resolution? Who can remember where he was working or who he was dating two decades ago? Twenty years is a long time. It's long enough to be born, raised, educated, and sent off into the world. Now is a good time to thank my Patreon patrons. Without your support, this would probably be post number 442, not 452, as I had good cause to skip many weeks, but I refused to relent. Thanks Patrons. A reader asked if we couldn't omit the internal coupling capacitor between the grounded-cathode amplifier and the split-load phase splitter in the Balancer. We could. For example, let's assume that the Balancer is being powered by a regulated B+ voltage or complex LC filtered power supply, so there is less of a need for the PSRR enhancement technique of the input stage halving the B+ voltage and the power-supply noise at its output. With a clean enough power supply, we could then reduce the grounded-cathode amplifier's plate voltage to one third of the B+ voltage and DC couple the input stage to the phase splitter. We still use the safety diode to prevent the phase splitter's grid from being exposed to the full B+ voltage while its cathode is a ground potential at start-up. With a B+ voltage of 300Vdc, the grounded-cathode amplifier's plate voltage of 100Vdc allows the phase splitter's triode to see almost 100V from cathode to plate. Note how the phase splitter's cathode and plate resistors and triode all see roughly the same voltage drop. At first sight, this might appear to offer the largest possible output voltage swing from the phase splitter, as it seems to imply two output swings of +/-100Vpk. It doesn't, as triode must see some voltage drop to draw current and we do not want the triode to enter positive grid voltages. In a line-stage amplifier, however, we are not seeking the maximum potential output swings. In a power amplifier, in contrast, we do. How do we get the biggest possible voltage swings from a split-load phase splitter? This amount of current flow against the cathode and plate resistor resistance gives us the voltage drop across these resistors. For example, if the B+ voltage is 400V and the plate resistance is 8k and the cathode and plate resistors are 16k in value, then the peak current flow is equal to 300V/(2x16k + 8k), which equals 10mA. And 0.01A/2 is equal to 5mA, which against 16k equals 80V. Thus, in this example, at idle the triode will see a voltage drop of 240V and the cathode and plate resistor will see an 80V drop. The peak output swing will come close to +/-80Vpk from each phase of output from the phase splitter. Returning to the Balancer, here is an example setup with no internal coupling capacitor. Okay, lets populate the circuit with part values and voltages. In three posts past, I covered the Super Class-A arrangement, wherein a beefy class-A runs under a heavy idle current and small power-supply rail voltages, while a class-B amplifier, which runs under a light idle current and large power-supply rail voltages, drives the class-A amplifier's floating power supply up and down in voltage. The result is that the class-A map acts as if its power-supply rail voltage were vastly higher in voltage, but without incurring the hugely greater dissipation that the higher power-supply rail voltages would entail. Do not fall into the confusion of thinking that the class-B amplifier is providing any signal gain to the class-A amplifier. It isn't. Instead, the class-B amplifier is only driving the floating power supply. In other words, as far as the class-A amplifier is concerned, the class-B amplifier does not exist. Or put differently, the class-B amplifier is part of the class-A amplifier's power supply. The class-B buffer runs off of the fixed +/-30V power-supply rails, while the class-A buffer runs off of the floating +/-10V rails. Now, in order for the class-A, push-pull buffer to remain in class-A, its idle current must be at least half of the peak output current swing. How do we find that amount? Simple: divide the peak voltage swing by the load impedance. In this example, 24V/8 equals 3A, so an idle current flow of at least 1.5A is needed by the push-pull unity-gain buffer. The class-B buffer, on the other hand, can let its output stage idle as near to zero amperes as we can get. But as we begin to drive the loudspeaker, the class-B buffer will experience all the current flow that the speaker sees. In other words, the peak current flow we expect with the class-B output stage to undergo is 3A. Let's now look at an extreme class-B buffer topology. Note how the class-B buffer's two OpAmps are powered by connecting to the floating +/-10V power-supply rails, while its two output transistors are powered by the fixed +/-30V rails. The class-B buffer makes the floating power supply move up and down like an elevator car. To see how this works, imagine the NPN transistor being fully turned on and the PNP transistor fully cut off; the floating power supply would still see the same 20-volt differential, but the top of the power supply would be near +40V, while its bottom would be near +20V. These two voltages will define the class-A buffer's power-supply rail voltages. As the class-A buffer follows the input signal, its power-supply rail voltage follow the same signal; thus, as far as the class-A buffer can tell it sees a constant +/-10V power supply. In fact, as far as it is concerned, its input and output voltages vary little from 0V. Since we used two OpAmps in the making of the class-B buffer, we could use two OpAmp to make the class-A buffer. A 1N4148 signal diode is used as a voltage reference and the two 0.1µF coupling capacitors deliver the input signal with a DC offset to the two OpAmps. The OpAmps then use their considerable gain and 100% negative feedback arrangement to establish the two DC offsets across the two source resistors. If we do the math, i.e. 0.35V/0.22 ohms we get an idle current flow of 1.59A, which ensured a class-A window of operation of 3A of peak current output swing. The two MUR410G ultra-fast rectifiers are there to force a hard limit to the potential voltage drop across the 0.22-ohm source resistors. This important to prevent the 0.1µF from ever becoming overcharged, which would prompt the OpAmps to reduce the idle current below what is desired. (This is not a perfect setup, as the buffer will see music signals, not square-waves. Nonetheless, in practice, it works fairly well. One potential workaround is to place an additional diode across each 0.1µF capacitor.) Okay, let's add this class-A power buffer to the the class-B buffer and the two power supplies. Of course, this is not the only way to go; it is only one possible way to implement Super Class-A power buffers. One possibility would be to use the LT1116 IC, which is an amazingly clever design. The LT1166 auto-biases the output MOSFETs by controlling the MOSFET's gate-to-source voltage. The IC offers an input pin, which interestingly enough is seldom used, even with the LT1166's data-sheet. Nonetheless, we can use two coupling capacitors to deliver the input signal to the two MOSFET gates. See post 211 for more details. On the other hand, if we want to do more work, we could use something like the following circuit, which is based on the famous diamond topology. 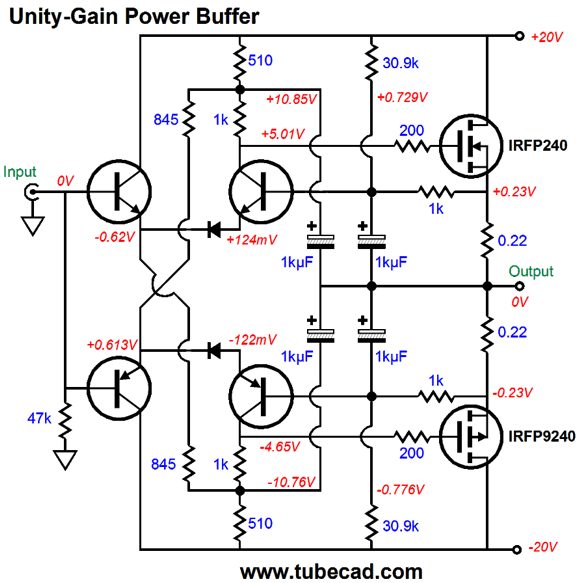 This power buffer idles 1.86A, which means that it can easily deliver 3Apk and still operate in class-A. 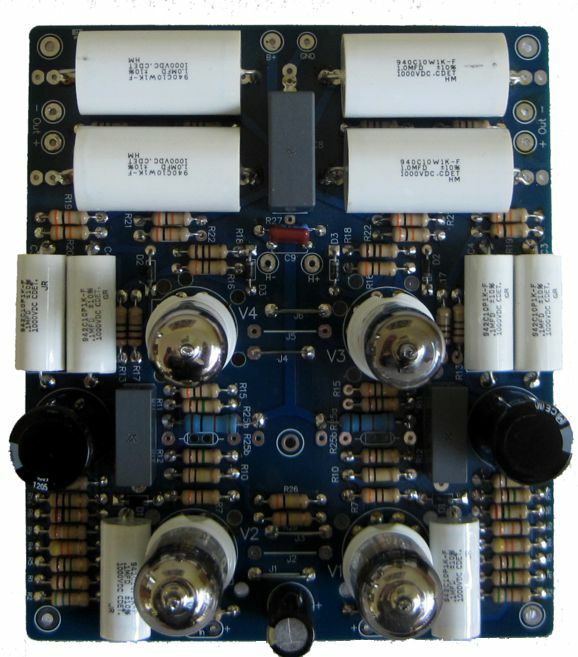 If this buffer is kicked out of class-A by either encountering too large an input signal or by having to drive a lower than expect load impedance, then the MUR410G ultra-fast rectifiers will engage. Actually the schematic shown above was meant to drive low-impedance headphones, not speakers. But topology is topology. We could easily scale up in idle current and reduce the rail voltages. We all know that a cathode-coupled amplifier looks like. 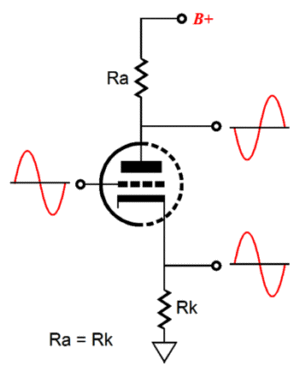 It is composed of a cathode follower buffer cascading into grounded-grid amplifier. 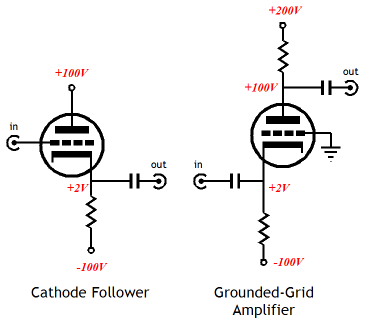 What if replace the grounded-grid amplifier with a grounded-cathode amplifier? Think of it as a cathode-grid coupled amplifier. But I prefer to call it a cathode follower & grounded-cathode cascade. Much like its cousin, the cathode-coupled amplifier, this circuit offers an extremely low input capacitance. Is that important? Yes. Here is why: when we vary the volume control's potentiometer's position, we also vary the high-frequency cut-off frequency of a grounded-cathode amplifier, as the potentiometer presents a varying output impedance, depending on its position. The worst-case scenario is at -6dB, as that is when the output impedance will equal one fourth of the the total potentiometer resistance. For example, with a 100k potentiometer, 25k is the -6dB output impedance, which against the grounded-cathode amplifier's MIller-effect capacitance will prompt a drooping high frequency response. Unlike the cathode-coupled amplifier, this circuit inverts the input signal's phase at its output. In addition, if we carefully choose the part values, this circuit delivers vastly better PSRR than the cathode-coupled amplifier. The secret is to juggle the two cathode resistor values until the deepest power-supply noise null obtains at the output. The constant-current source could be a FET with a source resistor or an LM334 IC, but we could also roll our own CCS, as shown below. I had to jiggle the part values to get the best PSRR figure. Since this last version is the lowest-tech version, its distortion should prove the worst of the three designs. Here is the SPICE-generated Fourier graph for 1Vpk at 1kHz. Far below 0.1% THD. Note the wonderful single-end cascade of harmonics. What I love about the circuit shown above is that it could have been created and built 80 years ago. If only I had a time machine. Consider this just part one of a two-part series on this circuit. While at the last RMAF, I heard a lovely rendition of the 1960's song, Diamonds Are Forever. Then I forgot about it—until a few weeks ago. I searched Tidal for all the covers they offered of the song. Well, I am fairly sure that I found the singer. Katie Melua was born in Kutaisi, Georgia, then part of the Soviet Union, and moved to Belfast, Northern Ireland when she was eight. A few years after, her family moved to London. Well, she is one of the huge army of famous people I have never heard of before. A dang shame that, as she has a lovely voice. I do remember hearing (in passing) one of her big hits, Nine Million Bicycles, long ago and my liking it. Had her family moved to Nashville, rather than Belfast, I imagine that she would be a huge country-western singer today. Her lovely voice suits any genre that deals with storytelling and emotion. On her Ultimate Collection album, many delightful songs are arrayed. Her cover of Bridge Over Troubled Water was particularly interesting. What about her cover of Diamonds Are Forever? She starts out beautifully, but never kicks into overdrive, so while silky sweet the song lacks the needed oomph that Shirley Bassey delivered. If you have been reading my posts, you know that my lifetime goal is reaching post 1,000. I have 548 more to go. My second goal is to gather 1,000 patrons. I have 927 patrons to go. Help me get there.